Let’s face it: filling timesheets is boring. We do it merely because either our bosses told us to or to keep track of billing for various clients. How many of us track our time to our own benefit? That is to help us in doing self-analysis and increasing our personal productivity? What if I told you that you can make your timesheet more fun? The kind of fun that makes you actually looking forward to track your time in various activities, even when nobody is telling you to do it. The kind of time tracking that helps you improve in allocating your time and effort. Whether the reports are easily readable and benefits you. How easy to enter the data as-you-go performing your various duties. It all starts with the scoreboard. That is the report. Your timesheet will only be as useful as the how you can see where have you been putting your efforts on and how each individual activity contributes to your overall well-being. This way you know whether you’ve been productive or whether you’ve spent loads of time doing lame busywork. Here is one example report of how you can analyze your time effectively. 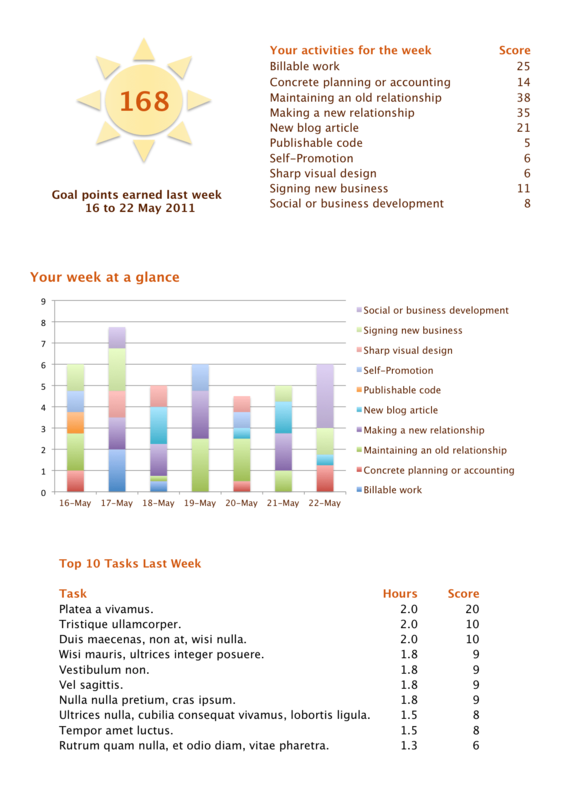 It shows a summary of your last week’s activity and how productive you were, for the entire week and broken down by day. By the way, the lipsum text are the individual activities (I haven’t been creative enough to list down real-sounding activities). The productivity score is calculated by attaching relative weights to each activity. Every activity will be assigned a category, which in turn the category defines the weight (“importance level”) of the activity. The productivity score for each activity is the weight multiplied by how many hours spent doing that activity. In turn the scores of each activity is rolled up to its category. From there you can see whether you were focused on high-value activities and being productive, or whether you’re spending time on not-so-important activities. If you’d like to see how the report was done, you can download the Excel spreadsheet used to create it. Beware: this is still a draft and not very easy to use yet. Tracking time is best when done as-you-go. That is, you enter data as you are doing the activity in question. One way to do it is to have a daily timesheet with the list of activities at the left hand side. Every row is an activity description followed by check boxes that shows how much time that you have spent in the activity. Each check box represents a 15-minute interval, and you fill in those as you are progressing with the activity. Ideally you should fill a box every 15 minutes, but it is more practical to fill in a series of check boxes whenever you are switching between activities. Having a gamified timesheet benefits you by having a nice looking report that encourages you to keep track of your time. Easy and quick data entry is also a contributing factor in making timesheets more enjoyable. Does this sounds interesting to you? We’re developing a software called SparkingSheet that gives you a fun way to track your time and do self-analysis and improve your productivity. You can fill in the form below to be the first to know when we launch. Follow us on Twitter via @SparkingSheet.